Profile Card Created by Eslamadel_. 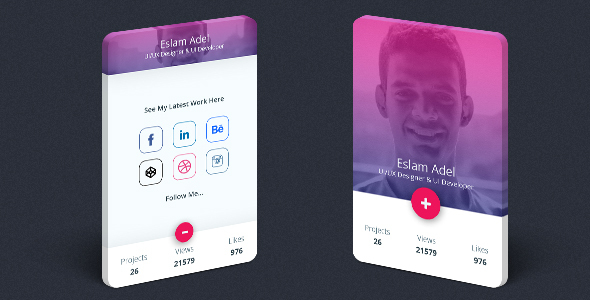 This templates have specific characteristics, namely: A stunning profile card to show your picture and social media accounts with smooth animation effect on Open/Close. It helps you have all your social media accounts in one place. It comes with clean code and unique class names starts with (pCard_) to distinguish between your classes.Watch the live . You can use this Profile Card on Css category for about, animation, card, css3, profile, profile card, social media and another uses. A stunning profile card to show your picture and social media accounts with smooth animation effect on Open/Close. It helps you have all your social media accounts in one place. It comes with clean code and unique class names starts with (pCard_) to distinguish between your classes.Watch the live demo to see it in action.